Hello hello. We are now filling 2013 CSA shares! Please let us know if you are interested in joining us this season, or if you would like more information. There is a brief description of Community Supported Agriculture on our website here and a write up about our CSA plan in a newsletter here. We are looking forward to our second season, learning more and figuring things out. And we are so very grateful to be able to share our farm and produce with such a wonderfully supportive community. Thank you everybody! Jeremy returned from running some errands a couple evenings ago, and got a photo before unloading – it’s worth sharing. 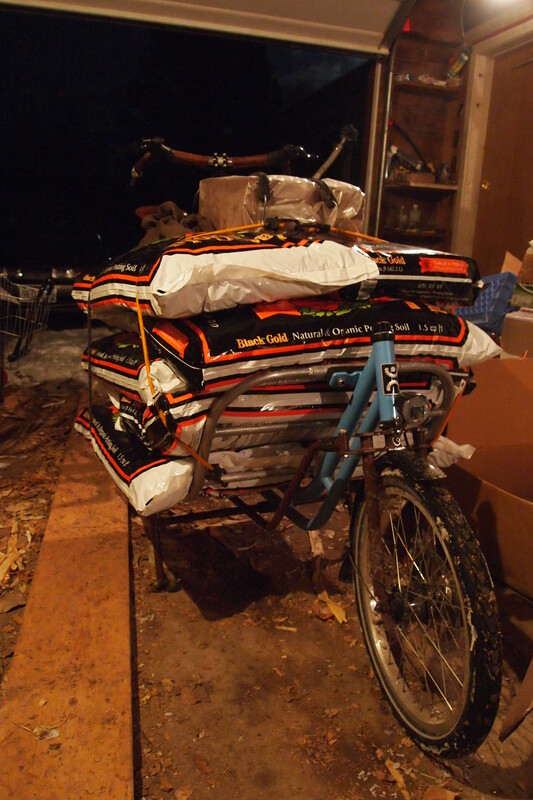 These are bags of potting soil, each of which weigh out at between 35-40 lbs. Ten of them make this a 350-plus pound load. What a smart bicycle. Bicycles. Human power. Hooray for a healthy planet. On the other hand, the heaps of potting soil here are industrially blended, wrapped in plastic, and have been trucked across the country. Sourcing a potting soil we are happy with has been a challange for us. We’ve spent a lot of time thinking about this. Ultimately (hopefully), we will have a healthy compost supply, have the proportions worked out, and we’ll be using a living homegrown seed starter substrate. Until we get there though, we are importing potting soil from off-farm. We’ve done a fair amount of research on what’s available, what the ingredients mean, where it comes from. Our primary choice was an OMRI certified soil, full of all sorts of happy things like aged PNW tree bark, coir fibers (coconut, not local but reasonably renewable), worm castings, and inoculated with mycorrhizal fungi. However in ordering this, we discovered it could not be shipped to South Dakota as the company doesn’t have a license to sell here. So instead we got a starter mix that includes perlite and peat moss. Neither of which we’re terribly happy about. It is organic, so it’s free from chemical fertilizers which are all-around high impact – but we can do a helluva lot better than that. We’ll plan ahead next year, and work on a homegrown substrate that grows healthy seedlings and is less carbon intensive in both production and shipping. Potting soil rant aside. Here are a few other shots from the past couple weeks. Trying to make the most of our last winter days indoors. Roald and squash, first pair of socks, Radish – number one good farm dog, farm fresh eggs, onions and leeks, ginger plum jam on ciabatta, learning to spin – whirling dertrish, sticker modifications. Other very exciting news: farmers are descending on the capitol! This weekend, along with farmers from all over the country, Jeremy is headed to Washington, DC. A group of farmers representing the National Young Farmers Coalition will join a large contingent of farmers from National Sustainable Agriculture Coalition member organizations to fly to Washington, DC to meet with Senators and Representatives. Because Congress bungled attempts to fix the Farm Bill, they are going to meet face-to-face to let them know what their farmer constituents need. So heads up Thune, Johnson, and Noem. Don’t worry, we’ve discussed this: he’s not bringing a pitchfork.